On Thursday February 24, 2011, the U.S. Census Bureau released the 2010 Census Public Law 94-171 Redistricting Data for the State of Hawaii. The main purpose of the redistricting data is to assist states in redrawing their Congressional and local legislative districts. It includes information on total population; population by major race groups, population by Hispanic or Latino origin; voting age; and housing unit counts. The redistricting data is the first set of 2010 Census information which provides us with a look at our local communities, areas from the county level down to the block level. 1. Population growth within the neighbor island counties was faster than the population growth in the C& C of Honolulu as well as the entire State of Hawaii. Between 2000 and 2010, Hawaii’s population grew by 12.3% and the C & C of Honolulu’s population increased by 8.8% . Population on the neighbor island counties, however, rose at a faster pace than C & C Honolulu. As a result, their shares of the state’s population has increased. This continued a trend that began in the 1980s. 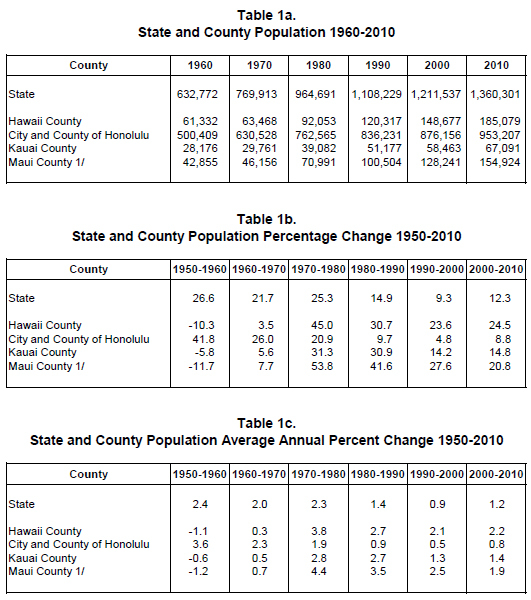 In comparison, the C & C Honolulu grew from The fastest growing counties between 2000 and 2010 were Hawaii and Maui counties, with a 24.5% and 20.8% increase respectively. The C & C of Honolulu now has 70.1% of the state’s population, slightly down from 72.3% a decade ago. The combined share of the three neighbor island counties grew from 27.7% to 29.9% between 2000 and 2010. Hawaii County’s population share grew to 13.6% (up from 12.3%), Maui County’s population share increased to 11.4% (up from 10.6%), and Kauai County’s population share increased to 4.9% (up from 4.8%). 2. Total population counts are now available for the smaller islands within the State of Hawaii. The 2010 Census provides us with the most accurate count of island populations since the last decennial census. Population counts for the lesser populated islands are almost non-existent between decennial census years. The islands of Molokai and Lanai decreased in population and now have 7,345 and 3,135 persons respectively. There were 170 residents on the island of Niihau, a net of 10 additional people from a decade ago. Among all the islands, Hawaii Island had the highest rate of growth at 24.5%. 3. There was a increase in the proportion of the population 18 years and older in our state between 2000 and 2010. In 2000, 75.6% of our state population was 18 years and older. The 18 years and older group has increased in the past 10 years to 77.7% of our 2010 state’s population. This trend holds true for all counties and islands within our state. 4. The proportion of our population that are of mixed race has increased over the past 10 years. Similar to other race groups, while the proportion of the population that are “Native Hawaiian and Other Pacific Islander” race alone has decreased since 2000, the proportion of the mixed “Native Hawaiian and Other Pacific Islander” people has increased. The Census 2000 was the first census in which respondents were allowed to select more than one race category. In addition to that, the category of “Native Hawaiian and Other Pacific Islanders” was separated from the “Asians” category. Newly released 2010 Census data allows us, for the first time, to assess the changes made in these specific race categories. The 2010 Census data revealed that 76.4% of our state’s population was of a single race, while 23.6% were in the two or more race category. In 2000, the figures were 78.6% and 21.4% respectively. Among the counties within our state, Hawaii County had the most people of mixed racial background, with 29.5% of its population selecting more than one race. Ten percent of Hawaii’s 2010 population were in the category “Native Hawaiian and Other Pacific Islander” race alone (compared with 9.4% in 2000), while 16.2% of our population were in the mixed “Native Hawaiian and Other Pacific Islander” race in 2010 (versus 14.0% in 2000). 5. Statewide, the total number of housing units increased by 12.8% between 2000 and 2010, with the greatest growth occurring in Hawaii County with a 31.4% increase. While the statewide population increased by 12.3% during this decade, housing units grew by slightly more at 12.8%. Occupied housing units were 87.6% of all housing units. These figures must be viewed with some caution, however. One component of the housing unit count is vacant units, which include those “for seasonally, recreational or occasional use”. States with a large number of timeshares and vacation rentals, therefore, have a higher vacancy figure. Census data being released later this year will show the number of units in this occasional use category. Source: Hawaii State Department of Business, Economic Development & Tourism, Research and Economic Analysis Division.